If you know me now, you'd know how much I love to drink coffee. It was a bit of an acquired taste for me. Initially, I was completely content with caffeine that contained plenty of sugar to offset the bitter taste of the coffee. I slowly graduated to trying different blends and mixes. While I would not call myself a coffee snob, I now only frequent certain establishments for my coffee fix. 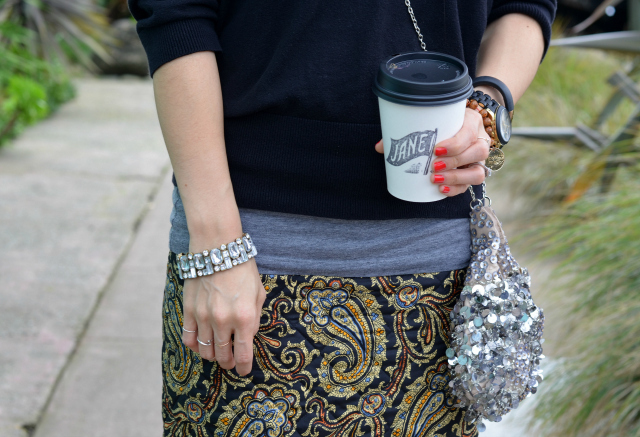 Lately, I've been obsessed with visiting Jane on Fillmore in San Francisco where they proudly serve Stumptown coffee. It's close to home and they serve plenty of yummy eats. It's a perfect pit stop to wind down the weekend or work week. Oh boy! Love your shoes!! So pretty! 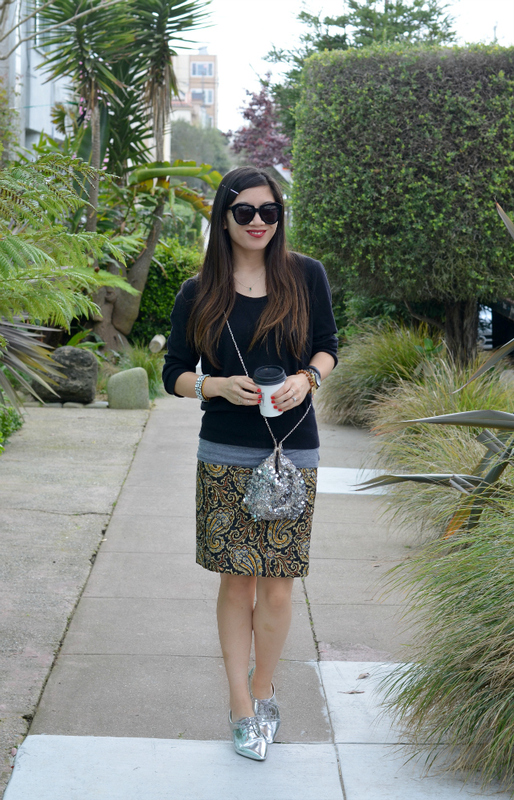 I love the skirt. Love the carefree elegance of this eclectic look. You are a girl after my own heart. I absolutely love coffee, and a little coffee shop makes me happy. 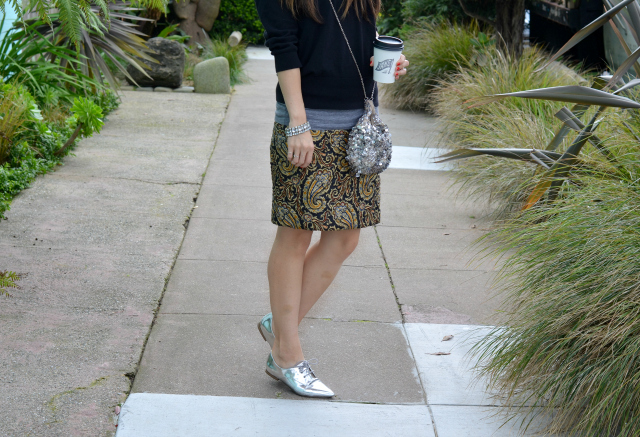 Loving the metallic pieces in this outfit! I've always ALWAYS loved coffee, but leaned more toward the sugary and sweet variety. But then I got pregnant and hated coffee. And now I prefer less sweet coffee. Weird. Nonetheless, I love your skirt in this outfit! And those oxfords are too cute! I love how, when I look at it objectively, there is a lot going on with this outfit with shiney bags and shoes and skirts...but it doesn't FEEL busy. It feels understated and carefree and that is fantastic. What an eye you have to balance everything so perfectly. Coffee lovers do have their favorite places. I don't blame you. 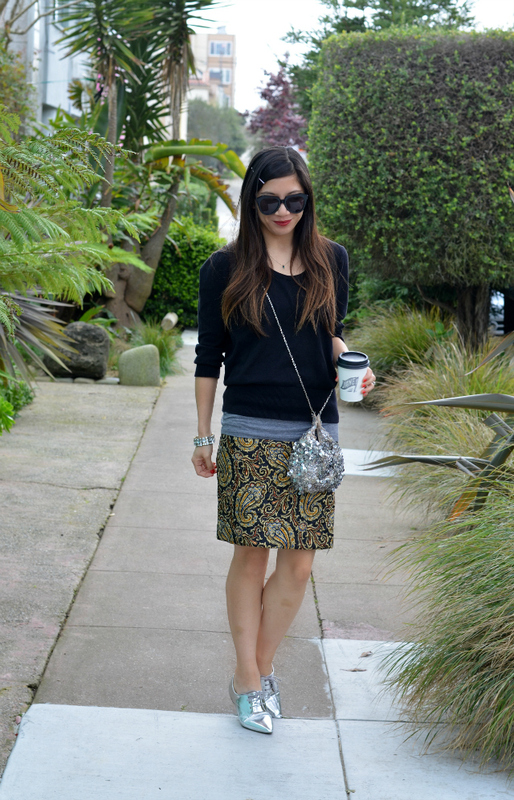 I LOVE that skirt and purse! Looks so good together. Those silver oxfords are awesome! So in love with all the metallics ESPECIALLY the shoes super cute. You look so gorgeous, I absolutely love this outfit, especially the sunglasses. I love the smell of coffee and luckily it does not agree with me. It makes me really jittery and stomach pains. It just sounds like such an expensive habit. Love all the metallic details on this outfit. Awww..you're drinking my city's coffee! :) I hardly ever buy coffee when I'm out bit I love a good green tea lemonade. 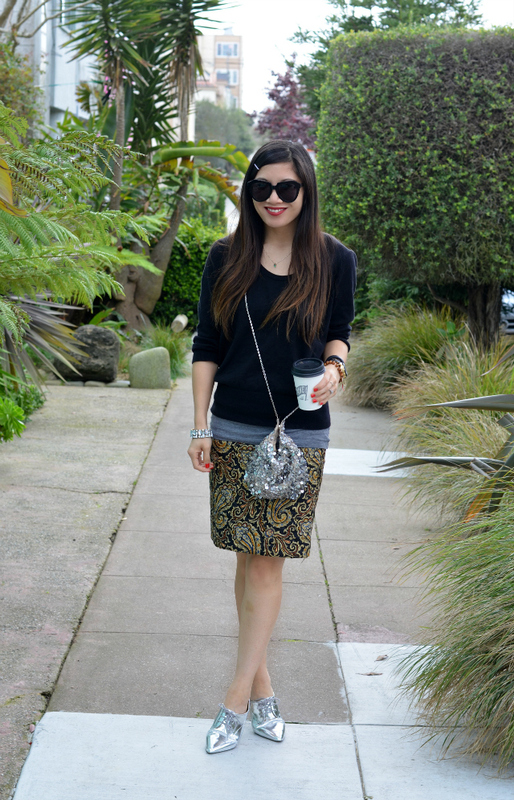 Oh my toss me that skirt....I'm a die hard fan of paisley on anything!! !